Fantastic beachfront property with great staff! 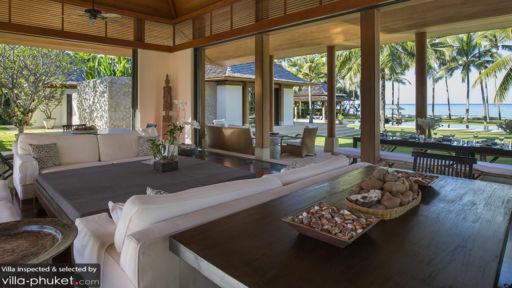 Beachfront Thai style villa comprising of 6 buildings. 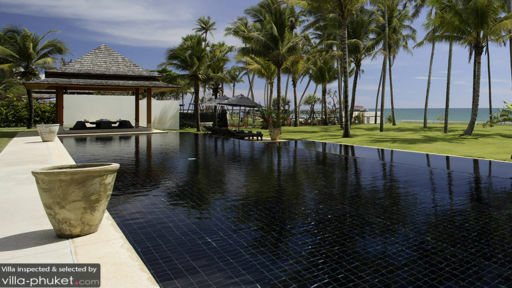 It has about 60 metres of beachfront about 30 minutes north of Phuket. 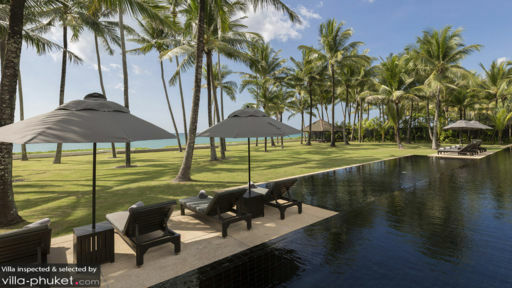 Beautiful gardens and a black 25 metres infinity pool with ocean view are further highlights. The villa manager Khun Wau and his staff made our stay a wonderful experience - food and service were great! Again! Well done! To the shanti team Wishing you all a wonderful weekend ahead. We are back in cold, grey Switzerland having left Villa Shanti's paradise three weeks ago. And as usual it was rather hard work to get used to everyday life again. As again we and our friends were thoroughly spoiled by your phenomenal crew at Villa Shanti, by the sun and sea of Thailand, by the luxury of Villa Shanti in blissful general... Mr Wow welcomed us stating that we were more than just guests, that Villa Shanti should be regarded by us as home away from home. He and his crew certainly lived up to this promise. We did indeed feel like being at home, like being with friends. It was - to sum it up - once more a holiday spelled perfection, warmth, kindness and complete relaxation. Forgive us if we repeat ourselves but what is true stays true: Villa Shanti is our haven, our paradise and indeed our home away from home. Thank you both from the bottom of our hearts for granting us to call it so. So it will hardly be a surprise to you that we are determined to come back with our friends. Definitely so. But as planning at the time seems difficult for quite a bunch of reasons - being four couples with eight busy walks of life and all. So please bear with us and allow us to contact you later to see how things are standing. Be assured that we will indeed return to Villa Shanti. As otherwise something very important, something very, very dear to us would be missing from our lives. For the time being let us wish you both and your loved ones the best of health and a most happy Chinese New Year! Dear Villa Shanti team and owner, please kindly know that every single day was filled with amazing care and attention that we received at your beautiful villa by your wonderful staff, we send praises and best wishes. We have enjoyed it so much that we have and will definitely recommended it to so many people as 'THE' single best possible romantic family getaway in the whole of Thailand! My guests were simply stunned by your taste. Everyone was so professional and they stay has exceeded our every possible wish.